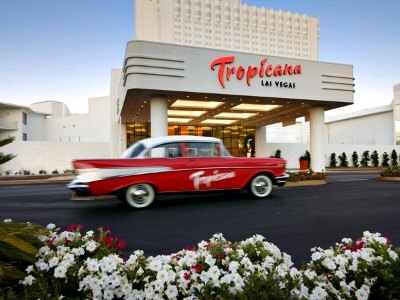 The Tropicana Hotel Las Vegas will remind its guests that they are visiting South Beach. This hotel was renovated in 2011 and boasts a décor that is bright in color, full of Latin artwork as well as gorgeous tile work. The Tropicana Hotel Las Vegas is a LGBT favorite with its bright and airy feel that transcend the normal in Las Vegas accommodations. 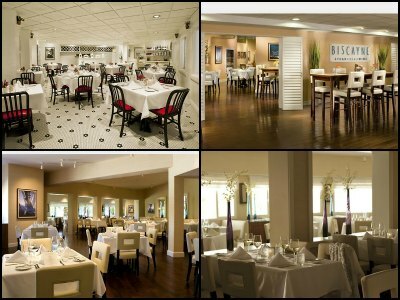 There are plenty of options for cuisine and the Beach Café has a boutique-style buffet as well as menu service. The property has exciting entertainment that includes the Laugh Factory and the musical Raiding the Rock Vault. The Tropicana Lounge features live music and an assortment of signature cocktails for guests. The Tropicana Hotel has one of the best pool areas in Las Vegas with swim-up blackjack as well as several unique cabana and daybed options for a true VIP experience. The Glow Spa by Mandara is the perfect place to remove the stress as well as the wear and tear on your body. The hotel has seven distinct wedding venues that will help make your special day truly memorable. All-in-all the Tropicana Hotel can offer guests a great location, luxurious accommodations, tasty cuisine and the laid back feeling a person might find while visiting South Beach. The Tropicana Hotel Las Vegas has over 1,500 rooms, suites and villas which are all newly renovated with a South Beach style décor. There are three distinct areas at the complex that includes the Paradise Tower, Club Tower and Bungalows. Guests will have a choice of five different rooms that offer something special. The smallest is the Club Deluxe that offers a king or two queen size beds, an oversized work desk and a small sitting area with customized furniture. The bathrooms are fresh and functional. The Paradise Deluxe adds an additional 100 square feet of space. The layout is similar to the Club Deluxe with a larger sitting area and bathroom. The Deluxe City View is similar to the Paradise Deluxe with an added feature of a view of the Strip. The Club Deluxe Plus Room has 475 square feet with a king size bed, dining table, sitting area with custom furniture and the bathroom has everything needed for a comfortable stay. The Bungalow Deluxe Room is 380 square feet and includes a balcony with furniture. 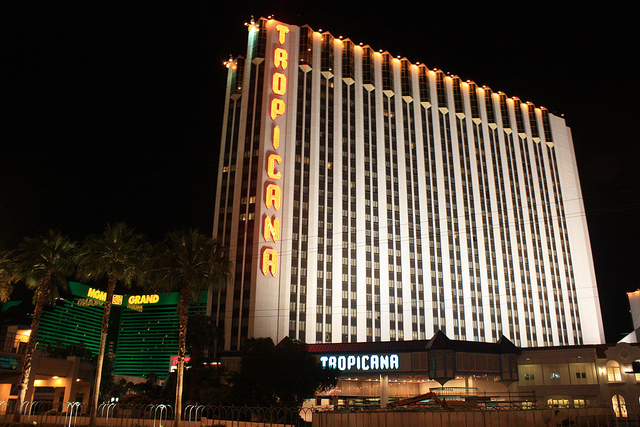 The room is conveniently located near all the Tropicana Hotel action and entertainment. Suites at the Tropicana Hotel Las Vegas are available in four stylish choices. The Paradise Suites are 900 square feet with a separate living room that includes a sitting area with custom furniture, work desk, dining table, a wet bar and refrigerator. The bedroom has a king size bed and sitting area as well as a bathroom with a dual sink vanity, soaking tub and shower. The Club Suites are similar in layout as the Paradise Suite and is 823 square feet. The Club Spa Suites are over 1,000 square feet with the same separate living area layout and includes a steam room, a sauna as well as an oversized whirlpool. The Penthouse Loft is over 1,700 square feet and has two levels each with its own entrance. The first floor has a spacious living area that includes a dining table, wet bar, refrigerator, work desk and plenty of custom furniture. The upper level has a king size bed, plenty of closet space and a sitting area. The bathroom is luxurious and guests can upgrade to include an oversized whirlpool tub. The Tropicana Hotel Las Vegas has four different villas available for guests that want even a little more luxury with the Pool Villa having an ocean side feel and the Sky Villas will remind people of being in a Miami penthouse. The Sky Villas are available in a one or two bedroom model. The one bedroom has 1,350 square feet which boasts luxury at its finest. There is plenty of custom furniture, work space area, wet bar, dining table and a half bathroom in the separate living room. The bedroom has a sitting area and a king size bed. The bathroom is expansive with an oversized shower, soaking tub, dual sink vanity and a makeup area. The bedroom Sky Villa is 2,700 square feet with an additional bedroom and bathroom to make life easy for couples, families or friends staying together. Villa One has 1,700 square feet inside and a sizable balcony for guests. These suites are lavish with décor and comfort as well as featuring an additional massage room. Enjoy two bedrooms as well as two and a half bathrooms that feature his and hers vanities. The Pool Villa has an 800 square feet indoor living area and a well portioned balcony with custom furniture. This one bedroom suite has a stunning view of the pool that includes a wet bar, dining table, work desk and refrigerator. The bedroom has a king size bed, a sitting area and the bathroom has a dual sink vanity, makeup area and a large walk-in shower. The Tropicana Hotel Las Vegas has been famous over the years for the entertainment choices that are located throughout the complex. The Laugh Factory is the perfect place to put a smile on your face where such big name comedians as Rich Little and Andrew Dice Clay as well as a stable of other funny people. The Tropicana Theater continues to be a hot spot with such feature acts as Raiding the Rock Vault which is a walk through rock and roll history. This musical offers guests music from the beginning of rock and roll to the 1970s to the 1980s and more. Raiding the Rock Vault boasts artists from such iconic rock bands as White Snake, Bon Jovi, Badfinger and more during this two hour concert. The musicians perform musical poetry from many famous rock bands including Led Zeppelin, The Who, The Doors and Jimi Hendrix. People looking for a little magic to spice up their Sin City visit then The New Illusions stage show starring Jan Rouven. This magical delight of this show is enhanced with articulate choreography that includes mystery, dancers, thrilling acrobatic artists and spectacular wardrobes. The New Illusions magic show will have patrons trying to untangle their confused minds after each amazing magic trick is completed. There is also entertainment at the Tropicana Lounge which features live music and traditional Las Vegas lounge shows. The nightlife scene at the Tropicana Hotel Las Vegas begins with the Tropicana Lounge which is located adjacent to the Tropicana Theater. This lounge offers great signature cocktail specials and plenty of live music for guests to enjoy. There is also Chill’m which boasts frozen concoctions in a souvenir glass and Lucky’s Sports Bar where patrons can watch their favorite teams from a plethora of sporting events. The Coconut Grove Bar is where guests can indulge in eclectic food and drink poolside. The casino at the Tropicana Hotel Las Vegas is somewhat smaller than other Strip casino. 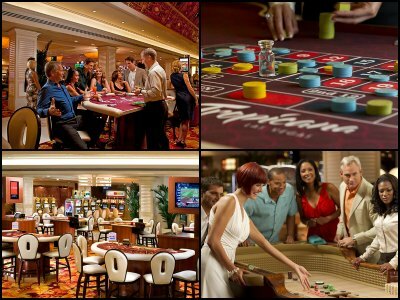 The 50,000 square feet area has a multitude of table games like blackjack, craps, roulette and baccarat. The casino area has over 800 of trendy slot and video poker machines to keep guests entertained. The High Limit area is private and allows patrons to lounge in elegance while playing their favorite high limit table games and slots. The race and sports book at the Tropicana Hotel has plush seating with 62 personalized betting stations. Guests can indulge in watching their favorite events on one of the six high-definition projector screens. The Beach Café at the Tropicana Hotel Las Vegas has one of the most unique buffets in Las Vegas. Guests that are dining inside will sit comfortably in a modern sleek looking décor that infuses lots of natural light indoors and patrons can enjoy the lush green gardens if they choose to eat outdoors. The buffet is only a single part of the Beach Café which is open 24 hours with regular menu service. The boutique-style buffet is filled with delicious selections that are hand crafted in the kitchen with fresh ingredients. Patrons will indulge in various cuisines from around the world and their stomachs will feel like they just ate at an exclusive chefs table. The buffet at the Beach Café is a welcome addition for hungry guests. 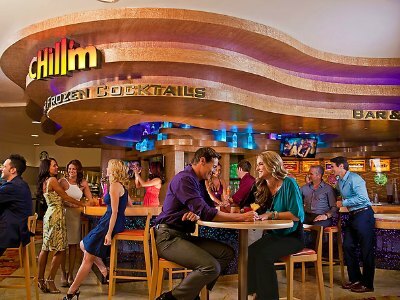 The Tropicana Hotel Las Vegas has a few exciting restaurants that will please guests pallets as well as their wallets. There is the South Beach Food Court that serves up quick cuisine from coffee to hamburgers to breakfast to pizza. The casual dining scene includes the Beach Café which boasts 24 hour menu service and a boutique-style buffet. On the upscale side of dining there is Bacio Italian Cuisine which serves delectable traditional Italian dishes and the Biscayne Steak*Sea*Wine features dry-aged beef. The Tropicana Hotel Las Vegas has a great pool area that is set on two acres that mimics South Beach. This pool has been voted the Best Pool in Las Vegas because of the superb amenities that are available. There is plenty of deck space for you to lounge in the sun with eight stunning options for daybeds and unique cabanas. Guests can also enjoy innovative food and signature drinks poolside served up by Coconut Grove Bar. Patrons can even participate in swim-up blackjack at one of the many tables offered in the pool for your enjoyment. 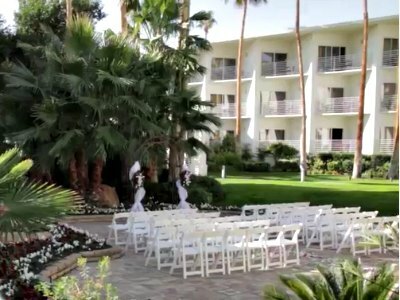 The Tropicana Hotel Las Vegas has seven different wedding venues for couples to enjoy on their special day. Couples have two options for indoor weddings with the wedding chapel which can accommodate 100 guests with a modern tropical feel as well as the Havana Room that is enhanced by numerous crystal chandeliers and seats 300. For outdoor ceremonies options range from the Courtyard and Terrace which have a room for 150 guests; the Beach Club has candle light ceremonies for up to 200 people and the Arbor is an intimate area for 30 patrons. The Raiding the Rock Vault Wedding Ceremony which features Paul Shortino as your ordained rock star minister is truly unique. The Tropicana Hotel has several packages as well as expert weeding planners that can make your wedding ceremony something special. 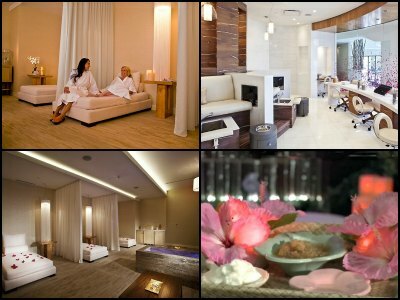 The Glow Spa by Mandara at the Tropicana Hotel Las Vegas is 10,000 square feet of pure relaxation. This tranquil area has lots of soft wood and colors to enhance your experience. There are nine private rooms for treatment as well as a Couples Wet Villa and Suite. The Glow Spa by Mandara has separate areas for men and women that include such features as plush furniture, steam rooms as well as a dry vanity space. There are over fifty signature treatments available for guests to enjoy that range from a Sweet and Spicy Orange Body Scrub to an Aroma Spa Seaweed Massage. The Tropicana Hotel Las Vegas has a small assortment of shops located throughout the Palm Way. Shops include A Garden Floral which has been voted the best floral shop in Sin City; Welcome to Las Vegas Retail offers all types of souvenirs; Ruby Blue has exciting and trendy costume jewelry; MR Accessories boasts apparel for women and a variety of accessories and the Hello Kitty Store features a plethora of items from this iconic cartoon figure. There are three other stores for all of your other necessary personal items like snacks, liquor and sundries. In addition, the Tropicana Hotel will be opening an expansive shopping area in 2016 that will include 160,000 square feet of flagship stores and two additional restaurants.